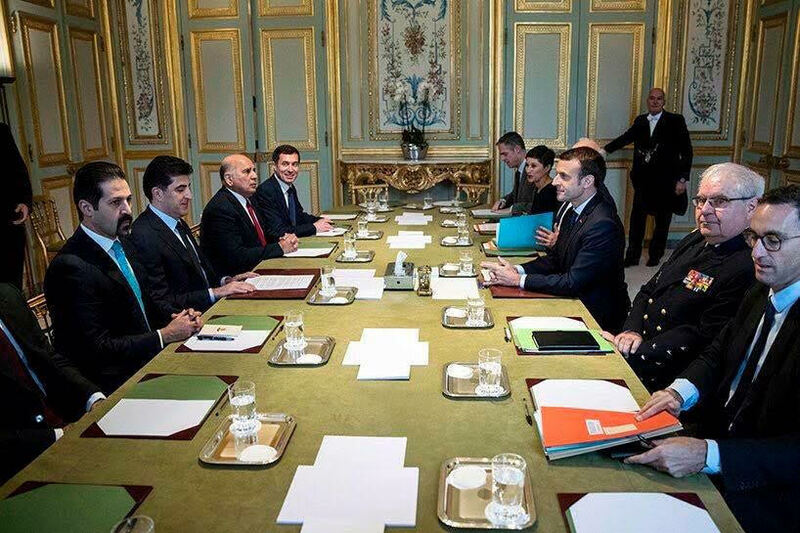 Erbil, Kurdistan Region, Iraq (cabinet.gov.krd) A Kurdistan Regional Government top level delegation led by Prime Minister Nechirvan Barzani, accompanied by Deputy Prime Minister Qubad Talabani, met President of France Emmanuel Macron at the Elysee Palace in Paris. The delegation also included the Chief of Staff at the Kurdistan Region Presidency Fuad Hussein, KRG Spokesperson Safeen Dizayee, and the KRG Acting Representative in France, Ali Dolamari. President Macron expressly recognized the legitimacy of the Kurdistan Regional Government and the political process in the Kurdistan Region. He affirmed support for an active and strong KRG, stressing the importance of internal unity in the Region. He also appreciated and praised the role of the Kurdistan Region’s Peshmerga as an effective force in the fight against ISIS, adding that France’s support and coordination with the Peshmerga will continue. President Macron reiterated France’s readiness to assist in resolving outstanding issues between the Kurdistan Region and the federal government in Baghdad. He emphasized implementing all articles of the Iraqi Constitution and that the rights of the people of the Kurdistan Region must be protected. He said he will call the Iraqi Prime Minister and discuss with him the sanctions and other measures taken towards the Kurdistan Region. The President of France expressed concern about the Hashd al-Shaabi (Popular Mobilisation Units) forces and other militias, and stressed Iraq should keep its sovereignty and make its own decisions away from foreign meddling. Prime Minister Barzani thanked President Macron for his invitation and reception, highlighting France’s historical stands with the people of Iraqi Kurdistan during difficult times. Prime Minister Barzani called upon the European Union and the Coalition against ISIS in general, and on France in particular, to play roles in assisting resolving the issues between Erbil and Baghdad on the basis of the Iraqi Constitution and to support the Kurdistan Region’s legitimate rights at the international level. Prime Minister Barzani stressed the KRG is ready to negotiate with Baghdad and cooperate on the issues of border crossings and airports. He emphasized that in order for stability to endure in Iraq, the Constitution must be implemented and the rights of all people in Iraq must be guaranteed. He said the Kurdistan Region as an integral political and constitutional entity must not be disregarded, as happened when the Draft 2018 Federal Budget was prepared and also when transfers of the agreed share of national revenue was suspended since 2014. Prime Minister Barzani said the free world must not allow collective punitive measures, taken by the federal government against the Kurdistan Region, to continue against the people of Kurdistan. The current political and humanitarian situation in the Kurdistan Region and Iraq, risks of foreign meddling in Iraq, the issue of the IDPs in the Kurdistan Region who have not been helped by the Iraqi Government and the fight against ISIS were also discussed.